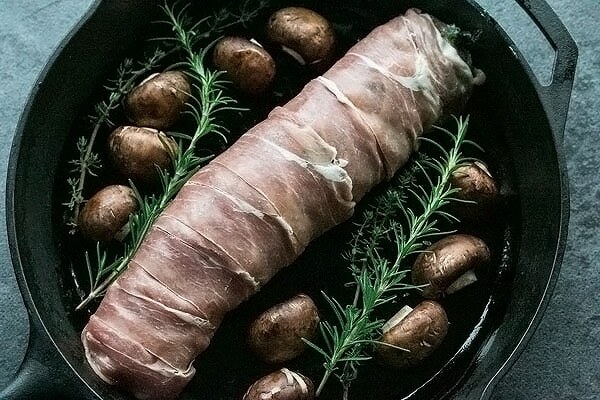 Impressive looking stuffed pork tenderloin that’s wrapped in prosciutto and roasted to perfection is easier than it looks to make. We will walk you through it. Perfect for date night, feeding a small crowd, or anytime you want to impress! Maybe we are old, or maybe we’re just tired of the over commercialization of everything, but we rarely go out for dinner on Valentines day. We like the idea of having a special day to celebrate love in our lives, but we much prefer staying in and making a special meal for our men. And I think they appreciate it too. 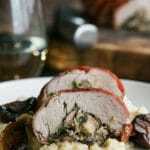 This stuffed pork tenderloin is an elegant meal and it looks fancy without being difficult to prepare. And don’t worry, we will walk you through it. Whoever you make this stuffed pork tenderloin for is going to feel the love that you made it with! But first… pour yourself a nice big glass of wine. When you take the pork tenderloin out of the package, you may find that you have two pieces instead of one. This has happened to me many time and it doesn’t matter at all for this recipe. Just rinse em off and make sure to take off the silver skin first. This is the whitish connective tissue that is usually left on the tenderloin. We don’t want to eat that and its easy to cut off. Just slide your knife under it and slide the knife to the end. Keep doing this until all the silver skin is gone. Here’s a quick video to show you how. Get your filling going on the stove. Onions, mushrooms, garlic and spinach is a super flavorful and fragrant combination! Just try to keep it out of your mouth… we couldn’t… Preheat your oven now too. 400 degrees. Next your going to pound your tenderloin. Lay it out on a board or a piece of parchment or just your clean counter and pound it to about an inch thick. Use that wine bottle from before if its empty now, or use a meat mallet or tenderizer. Whatever works. 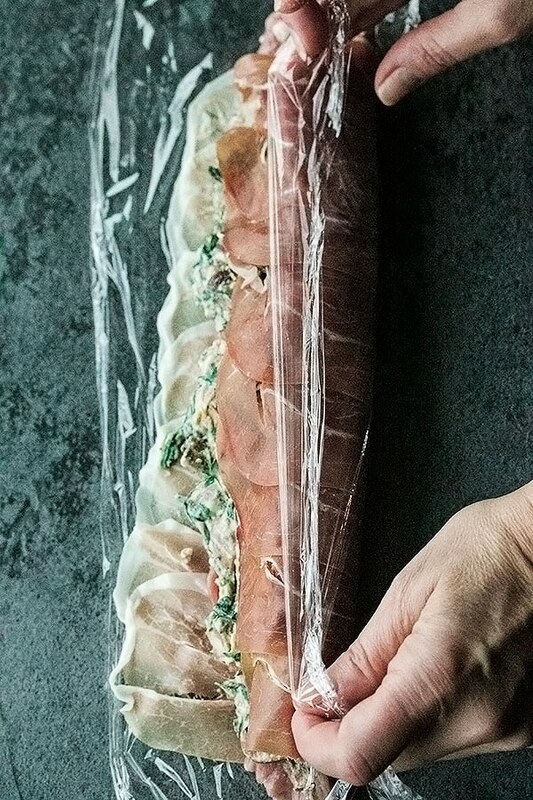 Then lay slices of prosciutto out on a piece of parchment paper or plastic wrap and make sure they are overlapping just slightly. Lay your tenderloin on top of that. Slather the filling on top of that when its ready. See? Easy. Now you are ready to roll! Take one side of the flattened pork and lift it up with the paper or plastic wrap. Then tuck the lifted edge of the prosciutto and pork into the middle and keep rolling until its all rolled up like a jelly roll. 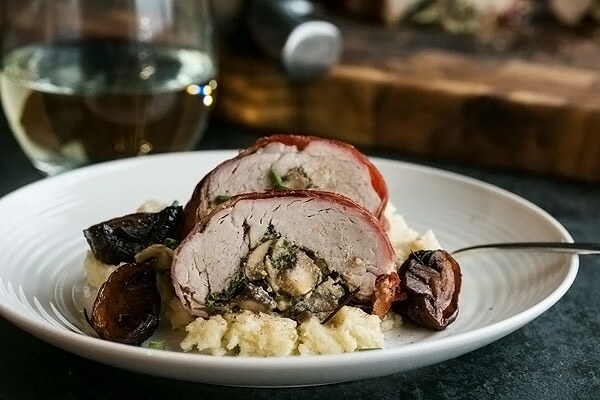 Now you have a stuffed pork tenderloin. See… easy! Put it into your pan, edge side down, and add some mushrooms and herbs if you wish, put in your meat thermometer, set it for 137 degrees and pop it in the oven. You want the pork roast to get to 140 degrees, but it will cook a little bit as it rests so taking it out at 137 degrees ensures that it doesn’t overcook. Doesn’t it look so awesome straight out of the oven! If your prosciutto doesn’t get crispy when the pork reaches 137 – 140 degrees just take the roast out of the oven, crank your broiler and when its hot, put the roast back in the oven. Then WATCH IT CLOSELY! You sure wouldn’t want it to burn after you have got this far. And all it takes is turning your back for a moment. Don’t worry, this only takes a min or so. We had to brown ours this way too. Make sure to cover it and let it rest for 5 – 10 mins. Resting your meat lets all the molecules calm down and this redistributes the juices of the meat throughout. 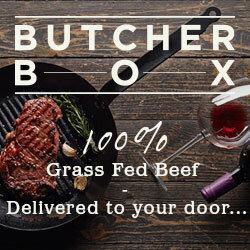 Its important if you want your meat to be juicy. And of course you do! 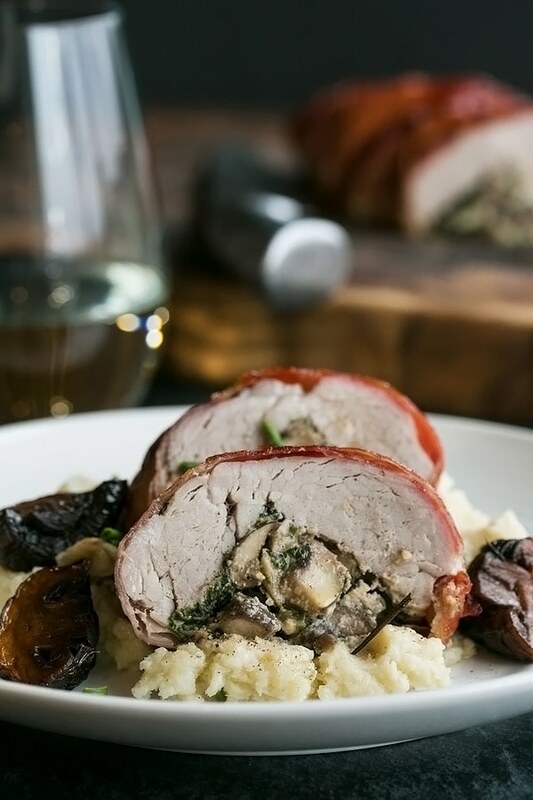 We absolutely love serving this stuffed pork tenderloin with our mashed “potato” cauliflower (recipe coming soon). It’s a really wonderful combo and you will be surprised how much you like cauliflower! Of course, this dish is also perfect with mashed or roasted potatoes. You really can’t go wrong either way. Serve with a side of roasted or steamed veggies and you have yourself a feast! Cast Iron Skillet – both Debbie and I love our cast iron. It never disappoints and works great if you want to serve your roast in the pan on the table. This one comes pre-seasoned and ready to go! Stainless Steel Skillet – we both got a set of these a couple months ago and they have become our favorite skillets. They heat up quick and make a really nice sear on meat. Meat Thermometer – a good meat thermometer is a must for cooking roasts perfectly. This one is the one we use. Meat Tenderizer – you can use a wine bottle or you can use one of these handy tools. Parchment Paper – so many uses for this stuff. We ALWAYS have it on hand. 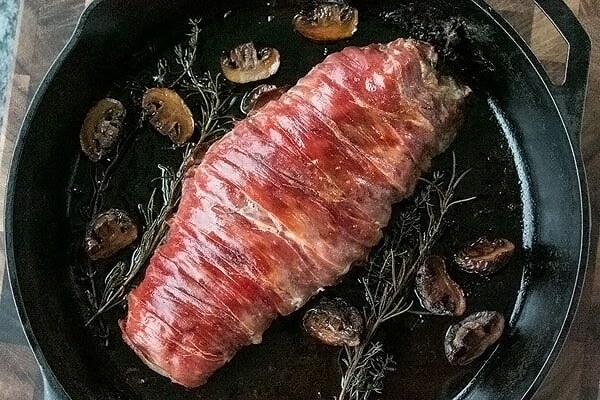 Impressive looking stuffed pork tenderloin that's wrapped in prosciutto and roasted to perfection. Easier than it looks to make so you come out looking like a star. Perfect for date night, feeding a small crowd, or anytime you want to impress! See the post above for a link to a video that shows you how to do this. Nutrition facts are for 1/4 of the roast.